What are Goody Green Bags ? Goody Green Bags are eco-trendy reusable bags for the style conscious and environmentally friendly shopper. The bags are made from non-woven polypropylene - a coated, water resistant material that is light-weight, durable, fire resistant and washable. I love these bags ! My favorite part of the design is how they fold so you are able to store them anywhere. I keep mine in my car so I always have it when I need it. On Christmas day I used it to carry presents from one house to another and everyone complemented me on my bag. *From Goody Green Bags site: Our bags are perfect for browsing the farmers market, trips to the grocery store, mall shopping, picking up take out, running miscellaneous errands, and even baby needs! They easily fold up and can be stored in your glove compartment, purse or pocket for easy access.Our bags are perfect for browsing the farmers market, trips to the grocery store, mall shopping, picking up take out, running miscellaneous errands, and even baby needs! 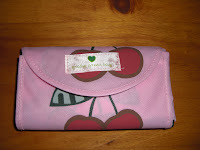 They easily fold up and can be stored in your glove compartment, purse or pocket for easy access. 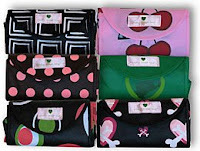 Our bags come in 6 fashionable patterns so there's a style for everyone! They are $8.95 each (or $39.95 for a 5 pack) and are sold online at www.goodygreenbag.com. Our bags were recently selected as the official gift bag for the 2008 American Music Awards and will also be included in the VIP celebrity gift bags for the 2009 Oscar and Golden Globe pre-parties. Win your own Goody Green Bag ! Visit the Goody Green Bags, then leave a comment letting me know which design you like. Blog about the contest - add a link to this blog & Goody Green Bags. Bad to the Bone! Bad to the Bone! That's me!!! Those bags look neat, my fav is the Martini. Twittered - and I follow you! I blogged here. LMAO! Beat you to the punch. Go find another review to highlight at PDP on Monday! I LOVE the martini one! So cute. I like the planet luv bag. My favorite is Bad to the Bone. Thanks for a great giveaway. Planet luv bag is my fav! caught my eye right away. ooohh, I love me a martini! Bad to the Bone is my favorite. I prefer Fair and Square. I like Planet Luv. Nice giveaway! I subscribe by email and Planet Luv was my favorite. My favorite is Planet Luv. Fair and Square - very chic! I love it! My favorite is Fair & Square. Thanks for the contest! I love cherries, so I have to choose Cherry Picking. My favorite is Planet Luv! My favorite design is "Martini", but I also really like "Fair & Square". Very nice! I like the Bad to the Bone! So cute. I love the Bad to the Bone one. So cute. 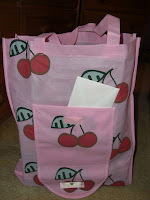 I like the Cherry Picking Bag. I like the Fair and Square. Thank you! I like the fair and square! Goes with what I wear!! My fav is the Bad to the Bone! January 4, 2009 at 8:31 AM This comment has been removed by the author. Bad to the Bone is BAD! The martini bag is my favorite. Thanks! Planet Luv is my favorite! What a fun giveaway!! Thank you so much. I love "Plante Luv" bag! I like the cherry picking design best. My favorite design is the Martini. Thanks for the giveaway! I like the Planet Luv! I like the Fair and Square bags! I love the Fair & Square design. The Martini one is really cute though too. The fair and square is my favorite. the martini is my favorite!! The Martini one is very colorful and would be fun to have! My fave is the Martini! I'm in love with the Planet Luv pattern. My favorite is the Martini Bag. I luv, the planet luv bag! My favorite design is Planet Luv. Thank you for the contest! Bad to the Bone is my absolute favorite! Fair and Square is my favorite. They are all great looking bags. Thanks for the nice and green giveaway. Thanks for thr Great giveaway!! I like Fair and Square best! I like the fair and sqaure. My favorite is Bad to the Bone. Thanks for the chance to win. I like the Bad to the Bone style! I like the martini pattern. I like the colorful Martini pattern--although the others are nice too. Thanks for the giveaway. Planet Luv is my favorite. I like the planet Luv. My favorite is the Fair & Square design. Very cute. the martini design is really cute! The brown with pink polka dots is to die for! These are awesome and beautiful! I liked the martini bad the best. Thanks for having the wonderful giveaway. I like martini. Very cool! Fair and Square is my favorite. So green is my efforts. My favorite is the Fair & Square design. Thank you for the opportunity to win!